岳维好, 周家喜. 青海都兰县阿斯哈石英闪长岩岩石地球化学、锆石U-Pb年龄与Hf同位素特征[J]. 地质通报, 2019, 38(2-3): 328-338. Yue W H, Zhou J X. 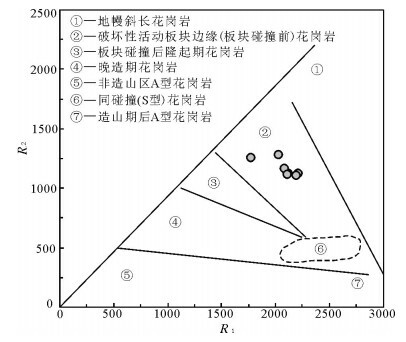 Geochemistry, zircon U-Pb age and Hf isotopic characteristics of the Asiha diorite in Dulan County, Qinghai Province[J]. 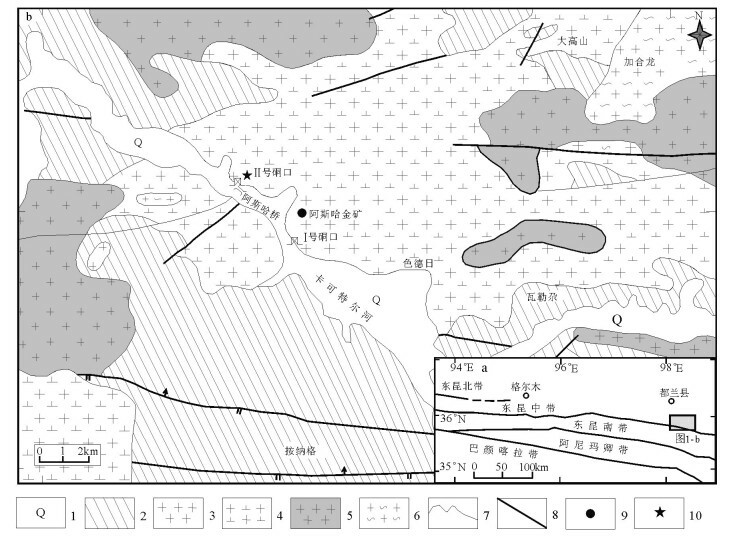 Geological Bulletin of China, 2019, 38(2-3): 328-338. Abstract: The Asiha diorite in Dulan County is batholith shaped output. The whole rock samples have characteristics by SiO2 (56.82%~61.15%), rich alkali (Na2O+K2O=5.31%~6.02%), low total iron (TFeO=6.09%~6.65%) and low TiO2 (1.02%~1.25%). Therefore, the diorite belongs to of high-K calc-alkaline rocks. The values of Cr (24.6×10-6~47.6×10-6) and Ni (12.8×10-6~17.6×10-6) are not high. The diorite is enriched in the LILE such as K, Ba, Rb, Th, U and LREE and depleted in HFSE such as Nb, Ta, P and Ti. 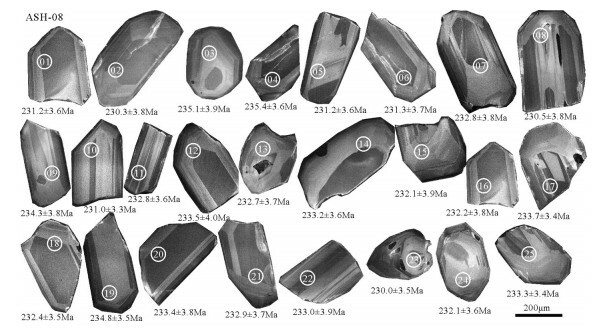 LA-ICP-MS zircon U-Pb dating results show that the crystallization age of the diorite is 232.6+1.4Ma, and the age belongs to the Middle Triassic. The zircons have relatively low εHf(t) values (t=232Ma, εHf(t)=-3.71~-0.84, -2.31 on average) and relatively old t2DM (1.32~1.50Ga, 1.41Ga on average), thus the magma should be derived from Proterozoic subducted crust. In summary, the magma had crust-mantle mixing characteristics, and the diorite was mainly derived from granitic magma of crust (Proterozoic subducted crust) and experienced activity of basic magma of the mantle. The rock was formed under the geodynamic background of conversion from subduction to collision, which represented the magma records of oceanic crust subduction from Late Paleozoic to Early Mesozoic in East Kunlun. 李碧乐, 孙丰月, 于晓飞, 等. 东昆中隆起带东段闪长岩U-Pb年代学和岩石地球化学研究[J]. 岩石学报, 2012, 28(4): 1163-1172. 姜春发, 杨经绥, 冯秉贵, 等. 昆仑开合构造[M]. 北京: 地质出版社, 1992: 183-217. 姜春发, 王宗起, 李锦轶. 中央造山带开合构造[M]. 北京: 地质出版社, 2000: 1-54. 郭正府, 邓晋福, 许志琴, 等. 青藏东昆仑晚古生代末-中生代中酸性火成岩与陆内造山过程[J]. 现代地质, 1998, 12(3): 344-352. 罗照华, 邓晋福, 曹永清, 等. 青海省东昆仑地区晚古生代-早中生代火山活动与区域构造演化[J]. 现代地质, 1999, 13(1): 51-56. 崔军文, 朱红, 武长得. 青藏高原岩石圈变形及其动力学[M]. 北京: 地质出版社, 1992: 1-164. 殷鸿福, 张克信. 东昆仑造山带的一些特点[J]. 地球科学——中国地质大学学报, 1997, 22(4): 339-342. 殷鸿福, 张克信. 中央造山带的演化及其特点[J]. 地球科学——中国地质大学学报, 1998, 23(5): 437-441. 岳维好, 周家喜, 高建国, 等. 青海都兰县阿斯哈金矿区花岗斑岩岩石地球化学、锆石U-Pb年代学与Hf同位素研究[J]. 大地构造与成矿学, 2017, 41(4): 776-789. Ludwig K R. Isoplot 3.0:A geochronological toolkit for Microsoft Excel[J]. Berkeley:Berkeley Geochronology Center Special Publication, 2003, 1-70. Woodhead J, Hergt J, Shelley M, et al. Zircon Hf-isotope analysis with an excimer laser, depth profiling, ablation of complex geometries, and concomitant age estimation[J]. Chemical Geology, 2004, 20: 121-135. 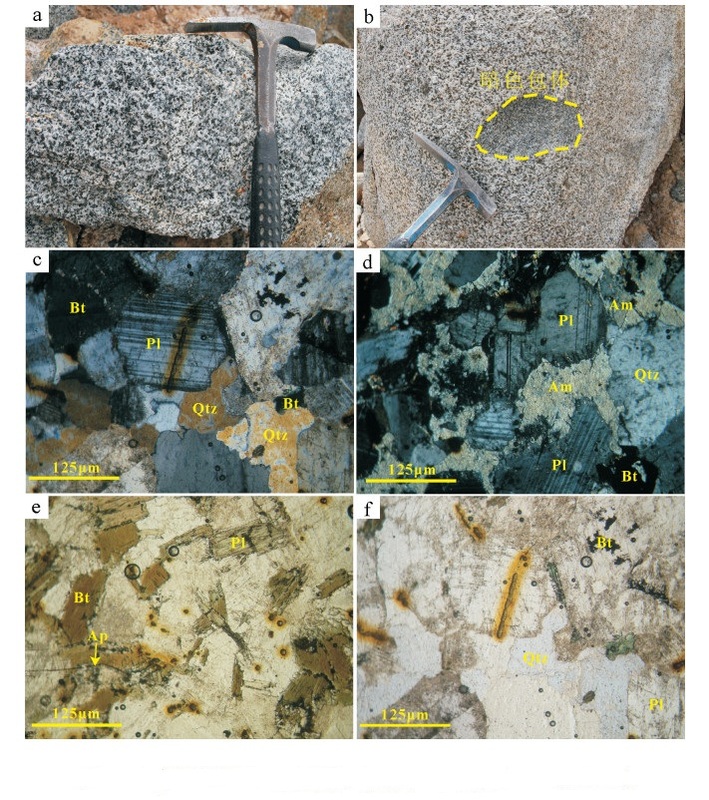 Blichert Toft J, Albarède F. The Lu-Hf geochemistry of chondrites and evolution of the mantle-crust system[J]. Earth and Planetary Science Letters, 1998, 148: 243-258. Griffin W L, Pearson N J, Belousova E, et al. The Hf isotope composition of cratonic mantle:LA-MC-ICPMS analysis of zircon megacrysts in kimberlites[J]. Geochimia et Cosmochimica Acta, 2003, 64: 133-147. Boynton W V. Cosmochemistry of the rare earth elements: Meteorite studies[C]//Henderson P. Rare Earth Element Geochemistry. Developments in Geochemistry 2. Amsterdam: Elsevier, 1984: 63-114. Sun S S, McDonough W F. Chemical and isotopic systematics of oceanic basalts: Implications for mantle composition and processes[C]//Saunders A D, Norry M J. Magmatism in Oceanic Basins. Spec. Publ. Geol. Soc. Lond., 1989, 42: 313-345. 吴福元, 李献华, 郑永飞, 等. Lu-Hf同位素体系及其岩石学应用[J]. 岩石学报, 2007, 23(2): 185-220. Kemp A I S, Hawkesworth C J, Foster G L, et al. Magmatic and crustal differentiation history of granitic rocks from Hf-O Isotopes in Zircon[J]. Science, 2007, 16: 980-983. Batchelor R A, Bowden P. Petrorgenetic interpretation of granitoid rock series using multicationic parameters[J]. Chemistry Geology, 1985, 50: 63-81. Yang J S, Robinson P T, Jiang C F, et al. Ophiolites of the Kunlun Mountains, China and their tectonic implications[J]. Tectonolphysics, 1996, 258(1/4): 215-231. 杨经绥, 许志琴, 李海兵, 等. 东昆仑阿尼玛卿地区古提特斯火山作用和板块构造体系[J]. 岩石矿物杂志, 2005, 24(5): 369-380. 熊富浩, 马昌前, 张金阳, 等. 东昆仑造山带早中生代镁铁质岩墙群LA-ICP-MS锆石U-Pb定年、元素和Sr-Nd-Hf同位素地球化学[J]. 岩石学报, 2011, 27(11): 3350-3364.